Windstar&apos;s addition of the three "motor yachts", recently acquired from Seabourn has been a pleasant surprise. AND it means, along with getting an outstanding level of service, the shipboard and cabin environment is more luxurious than what we have experienced in the past of the sailing vessels. We spent 3 nights in Rome before embarkation. Taking the train from central Rome to Civitavecchia was easy and helped us feel more at home in Italy. We love the chance to view countryside from a train whenever we can. Our cabin steward "Vina" was charming, attentive, and proactive in all the right ways. We are "diet coke" drinkers, with a slice of lime or lemon...all the time. By day two we had a bottomless supply in our cabin cold each day. By day three, the supply of lime never ran out either. (Our cabin review is in that separate review section.) One of the best parts of a ship with only 200 guests is how well staff can get to know you. And the Star Pride staff really seems to enjoy that as much as we did. Sunu, a dining room staff member did an exceptional job of becoming our favorite wait staff person, without making us feel over served. We did not see him every night at dinner, but his connection everyday at breakfast was an excellent start to our day. When we put together a dinner party for 10 on the last evening at sea, we asked to be seated at one of his tables. Before that point, Sunu may have not served any of our other fellow dinner guests, but he made us all feel like he had been a member of our "household" staff for years. Dining was also exceptional. The diversity of selections was fluid everyday and one never felt like the choices were created to impress rather than be enjoyed. Breakfast was offered by buffet or menu order on the Veranda, and one could get items both ways, as the wait staff always seemed to just know when we needed something. The various types of french toast were outstanding. The lox offered everyday at the buffet was the best I can ever recall having. One never waited for the custom omelette ordered from the buffet station. After ordering, we were given a number and a staff member brought it to our table. Dinner selections included remarkable starters and some old favorites with special touches. The shrimp ceviche was exceptional. The New York steak was perfect and made memorable by the apple sauce, chili bbq sauce. (I have the recipe!) Paella cooked outside on bbq night was excellent and the largest single pan of it, we have ever seen. Richard, our "Voyage Leader", did an excellent job of providing the next day&apos;s port information and shore excursion choices. We never felt pushed to take the Windstar excursions rather than explore on our own. Richard&apos;s style of sharing insights always made us feel like broad, usable information was just as important as offering shore excursions. The Windstar exclusive special event on Sicily at the Gambino Winery (full flight wine tasting, with lunch, for all 200 Star Pride guests) was excellent, felt very special, and logistically well curated. There were a surprising number of young people on board (about 20). They ranged from pre-teen to college age. They all knew they were in an adult environment and never made this feel like a party boat. But we will credit them for giving all of us older folks a very positive higher energy experience. And great credit goes to the parents for creating a wonderful family feel for everyone on board. We only heard one complaint about "the kids" and that complainer was more trouble than any of the kids. One of the families on board were our rafting partners, on our Cetina River rafting shore excursion in Split, Croatia. They made the day. About entertainment: Windstar does not try to be a "Las Vegas" cruise experience. We have never cruised with any focus on that. And both of the semi-acoustic duos on the ship were outstanding. We enjoyed them very much. If you cruise for the entertainment, Windstar may not fit for you. It fit for us. But we must say the "staff talent night" was great fun and well received by everyone. It seemed to be very mutually rewarding. And uproariously funny, tell the very end. I must add a key point: A good measure of whether or not a given cruise line is the right fit for you, is how you feel about the other guests you share the experience with. The Windstar cruise left us not only happy with the staff who served us and treated us well, but exceptionally happy with our fellow travelers. Most of them are folks we would look forward to sailing with again. Some will become life-long friends. Windstar&apos;s addition of the three "motor yachts", recently acquired from Seabourn has been a pleasant surprise. AND it means, along with getting an outstanding level of service, the shipboard and cabin environment is more luxurious than what we have experienced in the past of the sailing vessels. We spent 3 nights in Rome before embarkation. Taking the train from central Rome to Civitavecchia was easy and helped us feel more at home in Italy. We love the chance to view countryside from a train whenever we can. One of the best parts of a ship with only 200 guests is how well staff can get to know you. And the Star Pride staff really seems to enjoy that as much as we did. Sunu, a dining room staff member did an exceptional job of becoming our favorite wait staff person, without making us feel over served. We did not see him every night at dinner, but his connection everyday at breakfast was an excellent start to our day. When we put together a dinner party for 10 on the last evening at sea, we asked to be seated at one of his tables. Before that point, Sunu may have not served any of our other fellow dinner guests, but he made us all feel like he had been a member of our "household" staff for years. Dining was also exceptional. The diversity of selections was fluid everyday and one never felt like the choices were created to impress rather than be enjoyed. Breakfast was offered by buffet or menu order on the Veranda, and one could get items both ways, as the wait staff always seemed to just know when we needed something. The various types of french toast were outstanding. The lox offered everyday at the buffet was the best I can ever recall having. One never waited for the custom omelette ordered from the buffet station. After ordering, we were given a number and a staff member brought it to our table. Dinner selections included remarkable starters and some old favorites with special touches. The shrimp ceviche was exceptional. The New York steak was perfect and made memorable by the apple sauce, chili bbq sauce. (I have the recipe!) Paella cooked outside on bbq night was excellent and the largest single pan of it, we have ever seen. Richard, our "Voyage Leader", did an excellent job of providing the next day&apos;s port information and shore excursion choices. We never felt pushed to take the Windstar excursions rather than explore on our own. Richard&apos;s style of sharing insights always made us feel like broad, usable information was just as important as offering shore excursions. The Windstar exclusive special event on Sicily at the Gambino Winery (full flight wine tasting, with lunch, for all 200 Star Pride guests) was excellent, felt very special, and logistically well curated. There were a surprising number of young people on board (about 20). They ranged from pre-teen to college age. They all knew they were in an adult environment and never made this feel like a party boat. But we will credit them for giving all of us older folks a very positive higher energy experience. And great credit goes to the parents for creating a wonderful family feel for everyone on board. We only heard one complaint about "the kids" and that complainer was more trouble than any of the kids. One of the families on board were our rafting partners, on our Cetina River rafting shore excursion in Split, Croatia. They made the day. About entertainment: Windstar does not try to be a "Las Vegas" cruise experience. We have never cruised with any focus on that. And both of the semi-acoustic duos on the ship were outstanding. We enjoyed them very much. If you cruise for the entertainment, Windstar may not fit for you. It fit for us. But we must say the "staff talent night" was great fun and well received by everyone. It seemed to be very mutually rewarding. And uproariously funny, tell the very end. I must add a key point: A good measure of whether or not a given cruise line is the right fit for you, is how you feel about the other guests you share the experience with. The Windstar cruise left us not only happy with the staff who served us and treated us well, but exceptionally happy with our fellow travelers. Most of them are folks we would look forward to sailing with again. Some will become life-long friends. Our cabin was one of the simplest offered on this ship. But without question the space and layout made this cabin (at the lowest level), as luxurious as many higher-end choices on other premium/luxury cruise lines. 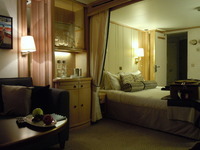 On the three "Star class" ships; every suite is at least 277sqft, has an easy curtain to separate the bed area from the seating area, and has a very roomy marble bathroom with a double sink. Number 117 is next to the staff "butler&apos;s pantry" and service elevator for the whole deck. We seldom heard anything. And we never heard the elevator. This is really the quietest ship we have ever been on. Our cabin and bathroom were spotless. They remained that way, without ever feeling like our steward was over-organizing our space. And the best touch here is the walk-in closet. Yes this is an older ship, but nothing feels like it has not been taken care of and everything is well maintained. A special note about "adjoining/connecting cabins": I just about every case on this ship, each cabin shares a short outer hallway with a cabin to its left or right. There is then an outer door that is never used unless needed to connect two cabins. This means it would likely be easy to get connected space regardless of where your cabin is on the ship. This may only prove difficult when as the ship gets very near to sold-out. Additionally, the ability for families or friends adjoining each other to still have their own privacy, when wanted, is easy and does not get in the way keeping a shared connection. A great part of the original design, which is now often incorporated into the design for new ships. A relaying trip around the whole island. The boat was very open and informal. Our driver and guide share a very full narrative of the island and life here. This excursion does not include the Blue Grotto (and we chose it for that reason), but we were taken to 3 or 4 lovely grottoes on the back side of Capri. We were pleased with the more peaceful and quiet feel. We did wish the boat had a better PA system on it. Some of the narrative was lost in the noise of the engine. What should have been a small group tour of about 6-8 people, turned out to be a private tour for just the 2 of us. 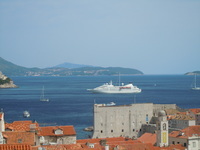 We covered far more scenic portions of Dubrovnik and the surrounding area than we expected. Our guide (a life long local) give us a touching history of an area torn by war in the very resent past. He gave us a lasting picture of his town and the Croatia beyond it. We spent a self-directed day in Kotor including covering a lot of territory by public transit. We had planned to bicycle on our own. The bicycle rental options were of very poor quality and the roads have no shoulders. We join the ship in Rome, after 3 days on our own exploring the city. We have been rafting all over the world. While this was not the most exciting river experience, it was one of the most fun and rewarding. Good class 2 to 2.5. And a chance to jump in and cover a brief distance out of the raft. A beautiful river we would be delighted to visit again. And a day which then included lunch at a large outdoor restaurant, right at our river exit point. Included transportation from our tender dock in Giardini Naxos through the country side and up the hill to Taormina. Our guide was a vast encyclopedia of regional knowledge. We wish we had taped her talk. Our time on our own in Taromina was fun, informative and this town is beautiful. Our guide and bus driver then got us on to the "WIndstar Private Event" at Gambino Winery.